Chennai Super Kings (CSK) played Kolkata Knight Riders (KKR) on Sunday, April 14, 2019, in the match no 29 of VIVO Indian Premier League (IPL). Chennai defeated Kolkata by 5 wickets in this game. MS Dhoni's daughter Ziva Dhoni cheers for Chennai team from stands during KKR vs CSK. MS Dhoni's Daughter Ziva Plays With Imran Tahir and Dwayne Bravo Post KKR vs CSK IPL 2019 Match, Watch Video. Chennai has now defeated Kolkata Knight Riders in both their clashes in IPL 2019. CSK defeated KKR the second time at Eden Garden, Kolkata. Chennai is now on the top of the point table with 14 points and has almost made it to the playoff. Good news for CSK is that their batsman Suresh Raina is back in form, as he scored 58(42) against KKR while chasing the total of 161. Chennai's right arm leg spin bowler Imran Tahir took four wickets in the previous match against KKR, where he dismissed Kolkata's major batsmen like Chris Lynn, Nitish Rana and Andre Russell. The South African cricketer Tahi was awarded the Man of the Match for his figure of 4/27 in four overs. 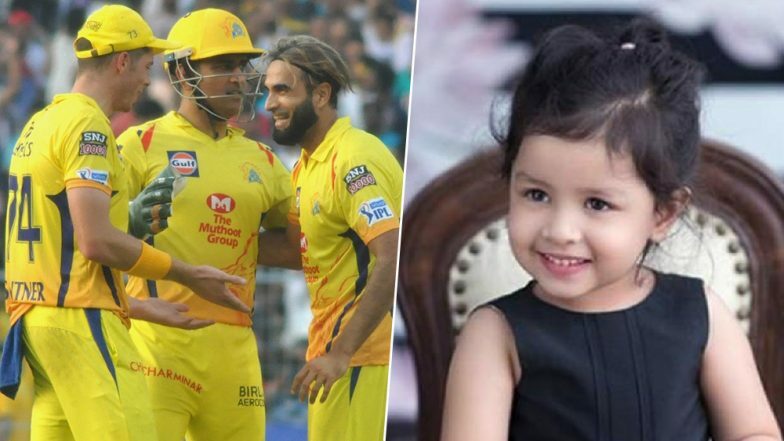 Ziva Dhoni is present in all CSK games to support her father's team, however, she sometimes catches the attention of the cameraman more than the players just because of her cute behaviour during the matches. Chennai is an evenly well poised balanced side with proper playing XI. Although, CSK side is missing their all-rounder Dwayne Bravo from past few games due to a hamstring injury. Bravo might make a come back in Chennai's next encounter with Sunrisers Hyderabad in match no 33 of IPL 2019.